Established for over 50 years, we are not a website only trailer company, we have 100s of trailers in stock and provide a fast, reliable after sales service. 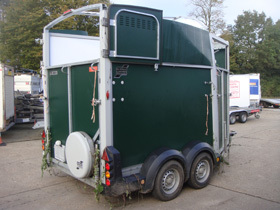 At Blendworth Trailer Centre in Hampshire we stock a huge range of horse boxes for sale from Ifor Williams single horse trailers to large double horsebox models and Cheval Liberté horse trailers. 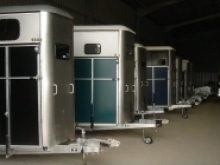 We have new and also used / secondhand horseboxes for sale as well as horse trailers for hire. We offer a trailer delivery service throughout the UK. Call us on 02392 412 731 for delivery costs and details of our trailer deliveries in your area. Trailer Training UK provide instruction in many different licence categories to prepare you to tow your trailer on the road. 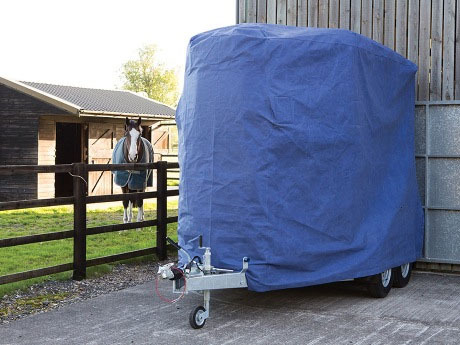 Ifor Williams horse boxes set the horse trailer standard throughout the UK and Europe ensuring the comfort and safety of your horse. Blendworth has one of the largest stock of horse trailers and horseboxes in the UK at our site in Rowlands Castle near Portsmouth, Hampshire. Visit us, call on 02392 412 731 or email sales@blendworthtrailers.co.uk for Ifor Williams horse box sales, horsebox towing information and advice. 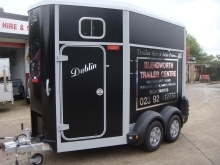 You can hire horse boxes from Blendworth Trailer Centre and we often have used / secondhand horse trailers for sale. 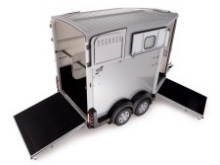 In addition to Ifor Williams horse boxes we slso sell and stock the Cheval Liberté range of horse trailers. For help and advice choosing your new or used / secondhand Ifor Williams horsebox or Cheval Liberté horse trailer or if you would like more details and information, visit us at Rowlands Castle near Portsmouth, call us on 02392 412 731 or email sales@blendworthtrailers.co.uk. 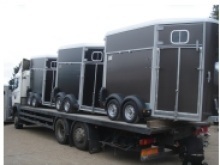 We will be happy to offer more information or advice to help you choose the best trailer to transport your horse. 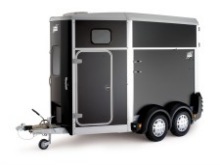 Ifor Williams have introduced a new generation of horse trailers with an all-aluminium body and streamlined roof design. 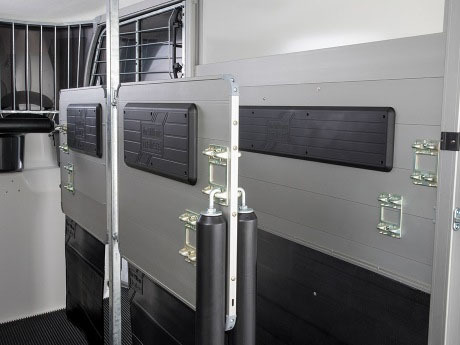 The new HBX horseboxes, available from Blendworth Trailers in Hampshire, include a host of innovative new features offering outstanding comfort for your horse. The chassis and body of the HBX trailers have been designed and engineered with weight and strength considerations at the forefront, providing a safe, strong and solid horsebox construction. 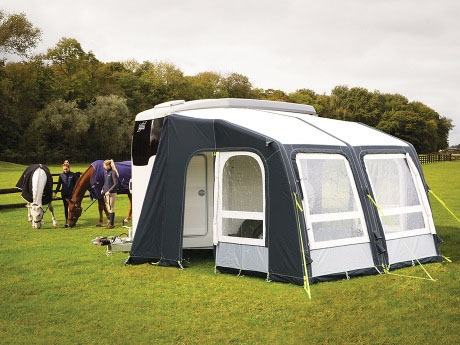 New features include the large rear side hinging combination ramp, stylish aluminium and diamond cut alloy wheels, optional GRP moulded tack locker and integral awning accessory. 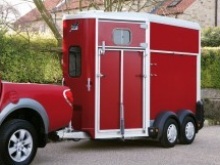 The HBX403 (pictured in red) is a single horsebox, suitable for the transport of a horse of up to 16.2hh, offering extra space ideal for horses who don't travel well or like a lot of room when being transported. The narrower overall width of the HBX403 single horsebox compared to the double horseboxes means it's easier to tow. 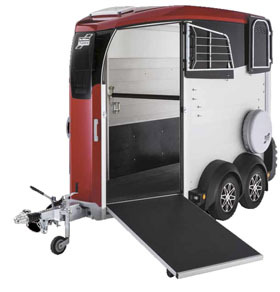 The rear ramp offers dual functionality operating as a normal ramp and it can also be opened as a side-hinged door, making cleaning out the horsebox much more convenient. 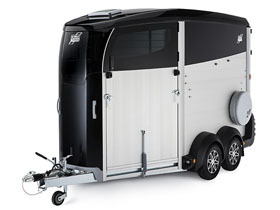 The HBX506 double horse trailer is ideal for transporting two horses up to 16.2hh. 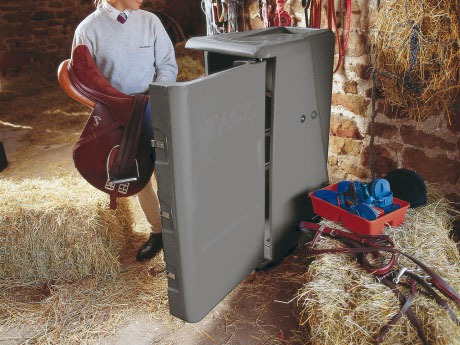 Available with the option of either a front ramp or a built-in tack locker, it features a pair of side windows, a large inspection window and centre partitions with breast and breeching bars as standard. 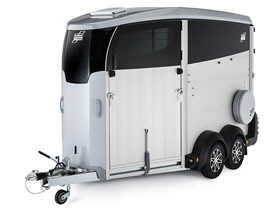 The Ifor Williams HBX511 is a slightly longer double horsebox comfortably transporting two 17.2hh horses. 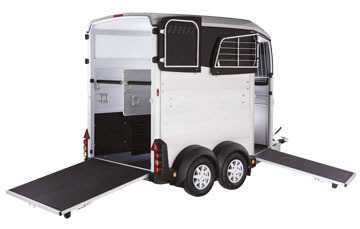 Like the HBX506 horsebox, the HBX511 is available with the option of either a front ramp or a built-in tack locker. Featuring a pair of side windows and a large inspection window the HBX511 also has a centre partition with breast and breeching bars as standard. 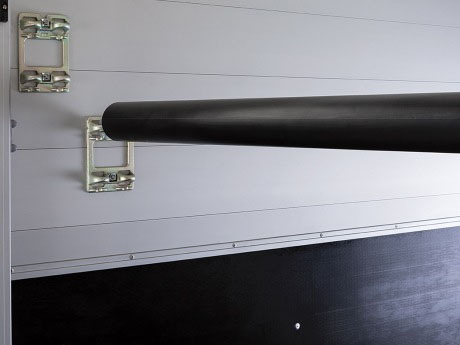 As with all the horse trailers in the HBX range, the rear ramp offers dual functionality by operating as a normal, secure and stable, low angled approach ramp that can also be opened as a side-hinged door permitting conveinient forklift access to the rear of the horsebox if required. 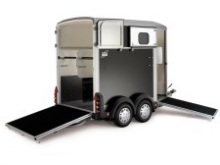 Call us at Blendworth Trailer Centre on 02392 412 731 for more details regarding the Ifor Williams HBX horse box range of options and accessories, availability and current prices. 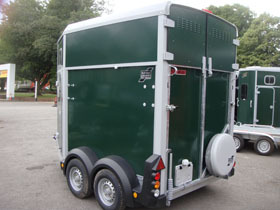 New from Ifor Williams Trailers the Ifor Williams Brunswick Green horse box. 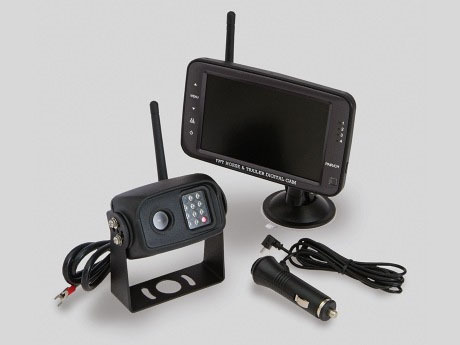 Available in either the HB506 model or the HB511. 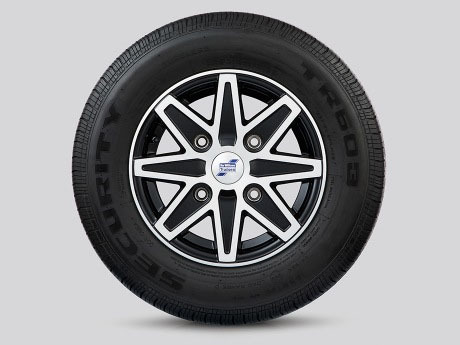 There are three new Ifor Williams horsebox models to choose from - the HB403, HB506 and HB511. 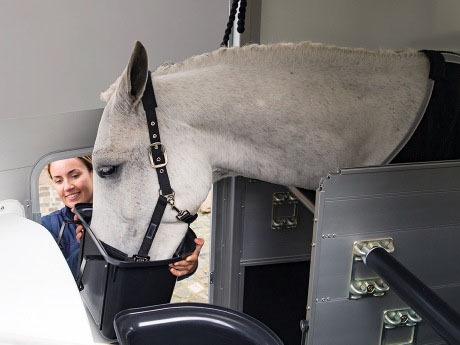 All Ifor Williams horseboxes are available and in stock for delivery from or collection at Blendworth Trailer Centre, these new horse boxes have a host of new features and improvements. 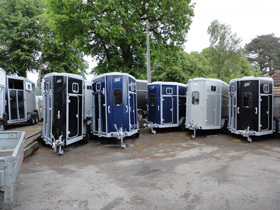 Each of the new models in the Ifor Williams range of horseboxes are available in a choice of five colours (black, graphite, blue, red, silver). As a single horsebox, the HB403 provides more stall width than the Ifor Williams double horsebox models and offers enough headroom to take one 16.2hh horse. Being a narrower trailer, the HB403 is easier to tow and produces less wind resistance when towing. 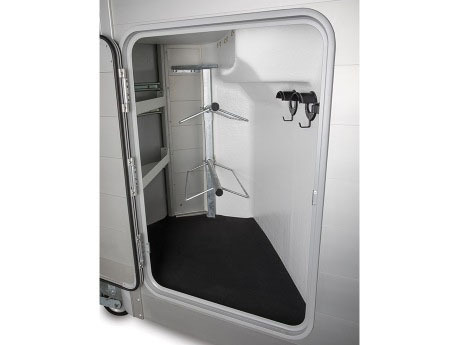 The HB403 is ideal for transporting nervous horses that require a wider stall and may prefer to travel alone. 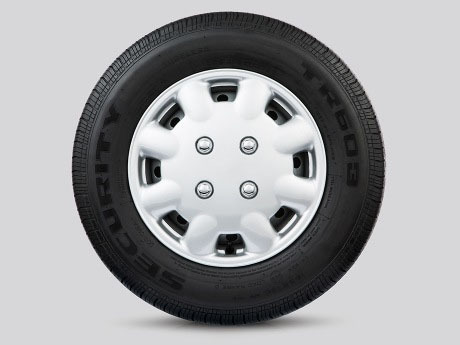 A 4x4 may not be necessary to tow the HB403 (depending on vehicle's towing capacity) and also provides towing options for drivers without the B+E category on their driving licence. 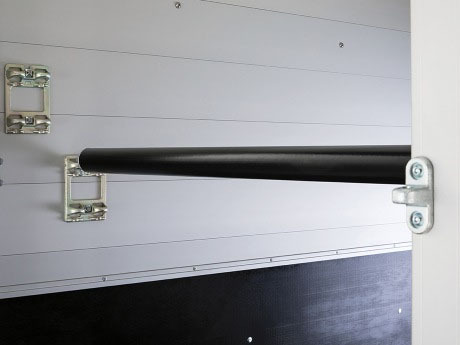 All of our horseboxes have sliding windows and hi-level brake lights fitted as standard. 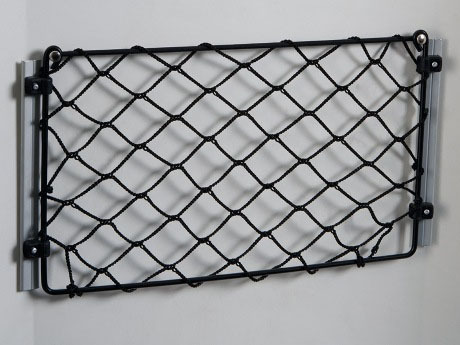 The HB506 model is suitable for two horses up to 16.2hh. HB506 models feature a pair of side windows and a larger front inspection window, allowing more daylight into the trailer. 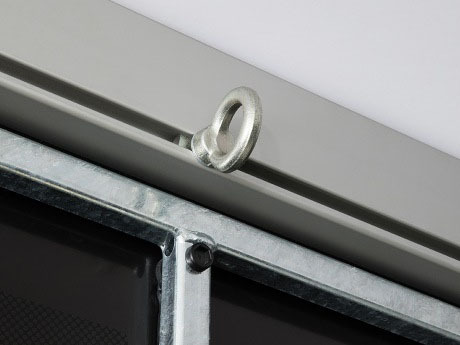 Centre partitions and breast and breeching bars are fitted as standard on the HB506 double horsebox model. 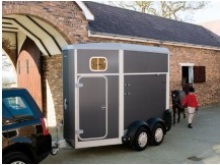 For horse owners with larger horses, the Ifor Williams HB511 is likely to be the natural choice. 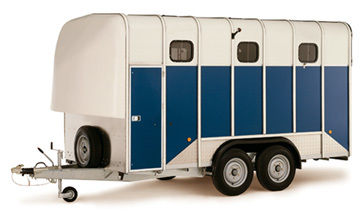 Being longer and wider than the HB506, the HB511 double horsebox is suitable for carrying two horses up to 17.2hh. The HB511 horsebox is fitted with a pair of side windows and a larger front inspection window, allowing more light into the trailer. 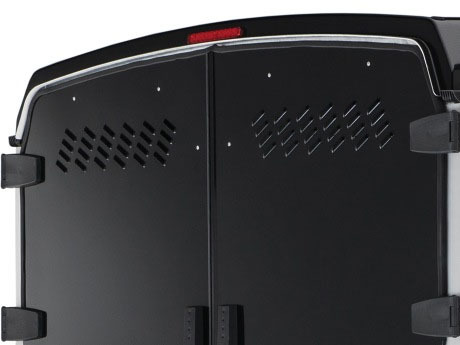 Call us on 02392 412 731 or email sales@blendworthtrailers.co.uk for more details on Ifor Williams horsebox accessories. 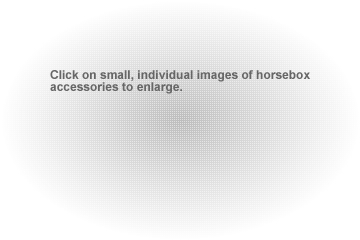 Click on small, individual images of Ifor Williams horsebox accessories to enlarge. 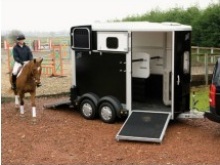 This is a new Ifor Williams HB511 horse trailer supplied new by Blendworth Trailer Centre. It ended up on its roof with two horses inside after the tow bar became detached from the towing vehicle due to corrosion, the horses escaped with minor cuts and are fine. Don't let this happen to you make an appointment with us and we can give a free tow bar inspection. For more details and advice on Ifor Williams horse box trailers please call us on 02392 412 731 or email sales@blendworthtrailers.co.uk. 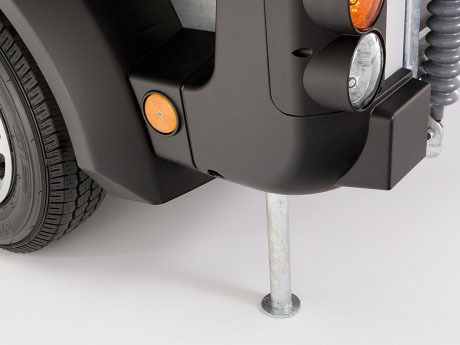 We also service and repair horseboxes, inspect and fit tow bars. Please visit us at Rowlands Castle near Portsmouth in Hampshire to see our huge range of new and used trailers for sale. 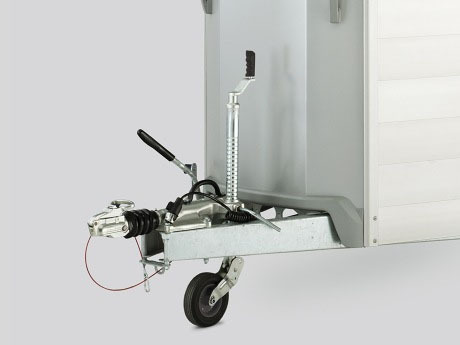 We are not an internet only company, established for over 50 years, we have new and used trailers in stock on site in Hampshire and offer a fast, reliable after sales service. 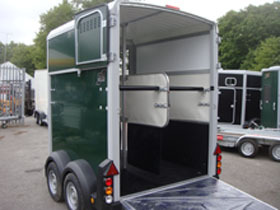 We service and repair all makes of trailers and horse boxes, contact us for more details. 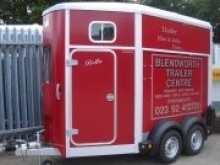 Call or email Blendworth Trailer Centre if you need spare parts for your horsebox or trailer.